Answers are FROZEN in time. Could historical atmospheric chemistry be frozen in a polar ice cap? It is generally accepted that precipitating snow retains a signature of atmospheric chemical and physical conditions at the time the snow fell. 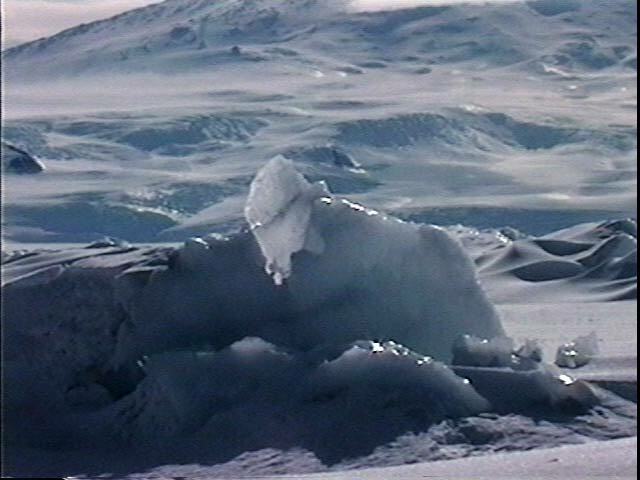 Impurities in the stratified polar ice sheets provide a very long-term record. This means hundreds of thousands of years of environmenal and climate change are preserved for research. Chemical components originally served as snow crystal nuclei or were incorporated as dry-fallout and became entrapped during sedimentary processes of snowfall and glacier growth. These soluble and insoluble impurities found in the polar ice sheets have been analyzed for clues to the past history of the chemical and physical state of the atmosphere. Impurities found in ice sheets have been analyzed by scientists dating back to the 1950's and 60's. Nitrate is one of the major soluble constituents found in polar ice. Atmospheric odd nitrogen (molecules which contain an odd number of nitrogen atoms) is responsible for the nitrate being deposited in the polar ice sheets. The ultimate product of the atmospheric chemical reactions of odd nitrogen is nitric acid, which is the second most important mineral acid implicated in the acid rain phenomenon. It is believed that nitric acid deposited from the atmosphere is responsible for the nitrates found in the ice sheets. Let's pause and define some terms regarding the vertical structure of the Earth's atmosphere. The Earth's atmosphere is usually described in terms of layers. As we go from the ground to the top of the atmosphere, these layers are called the troposphere, stratosphere, mesosphere, and thermosphere. Troposphere. This is the lowest region of the atmosphere. More than 80% of the total atmospheric mass resides in the troposphere. The troposphere exhibits decreasing temperature with increasing altitude. This is the region where most meteorological processes occur. The boundary at the top of the troposphere is called the tropopause. Stratosphere. This is the layer above the troposphere. The stratosphere contains most of the remaining mass of the atmosphere. The stratosphere and troposphere combined contain about 99.9% of the atmospheric mass. About 90% of the protective ozone layer resides in the stratosphere. It exhibits an increase in temperature with increasing altitude. This increase in temperature is due to heating by the absorption of ultraviolet radiation by ozone, which reaches a maximum concentration at the stratopause. Mesosphere. This means "middle" sphere. It is the layer above the stratosphere. This layer exhibits decreasing temperature with increasing altitude. About 99% of the remaining mass not in the troposphere and stratosphere resides in the mesosphere. The mesopause is defined as the boundary at the top of the mesosphere. Thermosphere. Temperatures in this layer range from 500 degrees K to as much as 2000 degrees K, depending on the activity of the sun. Although carbon dioxide, ozone, and odd nitrogen make up less than 1% of the remaining atmosphere, these species can be highly chemically reactive and have an important role to play in the photochemistry and energy balance of the atmosphere. Odd nitrogen in the Earth's atmosphere acts through catalytic reactions (a set of reactions that end up with what they originated from) of nitric oxide and nitrogen dioxide to destroy ozone in the stratosphere. The lifetime of odd nitrogen is long; therefore odd nitrogen can deplete a significant amount of ozone during its lifetime. This is why the production of odd nitrogen is an important consideration in the study of stratospheric ozone depletion. Odd nitrogen, nitric acid in particular, is also involved in the formation of polar stratospheric clouds (PSCs). Stratospheric clouds are aerosols that form in the polar stratosphere when it is cold, i.e., winter. Stratospheric particles which are proposed to contain nitric acid settle out of the stratosphere. It has been proposed that nitric acid condenses in the form of nitric acid trihydrate (NAT) crystals. Water crystals are also known to form in the polar stratosphere which may contain trace amounts of nitric acid. Photochemistry is the chemical interactions of atmospheric gases in the presence of incoming solar radiation photons (x-rays, ultraviolet radiation, and visible light). Solar radiation is the major source of energy given to the atmosphere which drives the photochemical processes. Photochemical processes initiate most of the chemistry which occurs in the atmosphere. One source of odd nitrogen in the stratosphere are the sources associated with high energy particle impacts. Natural sources for these energetic particles are the galactic, which originate from outside of our solar system but are modulated by solar activity, and solar cosmic ray particles, mostly protons with smaller numbers of alpha particles and heavier atomic nuclei. Solar cosmic rays do originate from our solar system, and solar flares give them a sporadic source. Because these energetic particles are charged, they only have access to the Earth's polar atmosphere where the magnetic field lines are "open" in the polar regions. Thus, these odd nitgogen sources are strongest in the polar atmosphere. The final fate of most atmospheric odd nitgrogen is nitric acid and nitrates. In the polar regions these may be precipitated out of the atmosphere and depositied into the polar ice sheets, recording the history of the odd nitrogen state of the polar atmosphere. Nitrates have been measured in polar snow and ice extracted from both the Greenland and the Antarctica ice sheets. Nitrate sequences observed in polar ice exhibit a seasonal variation in the nitrate concentration with the minimum occurring during the winter months and peaks occurring during the summer months. It has been suggested that the conditions of full summer sunlight and the period of highest temperature leads to an increase in sublimation resulting in an increase of nitrate concentration in the snow surface. The source of nitrates seen in the polar ice sheets are controversial and are not well understood. Therefore, the University of Kansas Department of Physics and Astronomy's Dr. Francis Vitt, then a doctorate candidate, made this the subject of his Ph.D. research. Vitt's conclusions showed that variations of odd nitrogen production and modeled concentration associated with energetic particles themselves do not explain all of the huge variations observed in the polar ice cap. Vitt utilized information from the IMP satellite in order to develop inventory of odd nitrogen in the middle and upper atmosphere. Computer models allow us to speculate and compare in an efficient manner. Vitt's models provide a more detailed and thorough picture as models are compared to observable evidence found in the ice.